The Bismarck Palm Tree, scientific name Bismarckia nobilis, is one of the most desired fan palms in Florida. The Bismarck Palm is native to the island of Madagascar which is off the east coast of Africa. It was a relatively recent introduction to Florida landscapes. 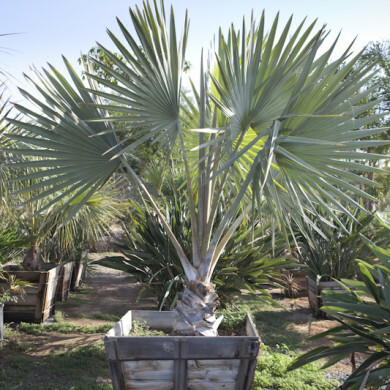 Bismarckia nobilis is a massive palm that will give dramatic effect to any landscape. This palm can be used as a focal point or for nice shade and screening. This palm can tolerate cold temperatures down to 15F and can be grown in states like Alabama, Arizona, Arkansas, California, Georgia, Louisiana, Mississippi, Nevada, Oregon and Texas. Common names: The Bismarck Palm is also known as Bismark Palm, Bismarckia Palm, Nobilis Palm. Family: It belongs to Arecaceae family. Origin: The Bismarck Palm is native to the island of Madagascar which is off the east coast of Africa. Appearance: The Bismarck Palm has a single smooth trunk topped with 20-25 wide fronds forming a spherical crown. 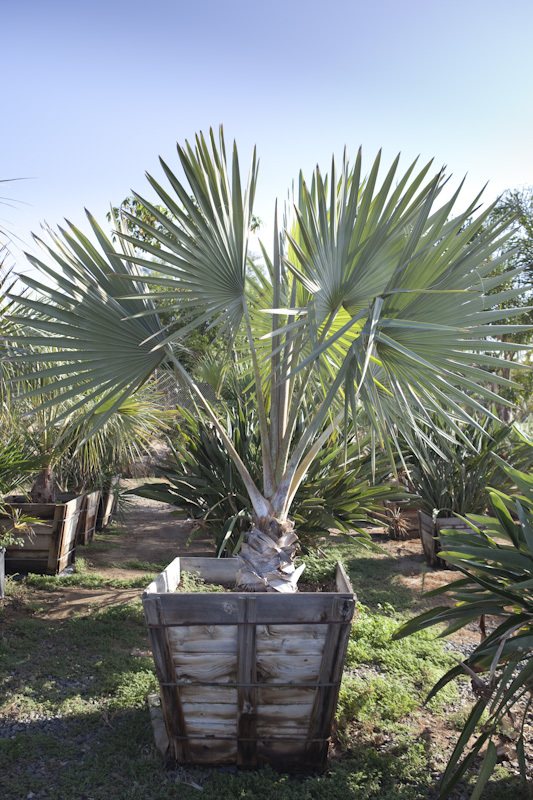 Younger Bismark Palm has grey trunk covered with old leaf bases which gets smoother as it matures. The Bismark Palm has palmate waxy leaves supported by thick stems. Stems are 8-10ft long, 10 inch in diameter and covered with small sharp teeth. Wide spread of beautiful silver-green leaves can reach 10ft across. Flowers/Fruits: During late spring Bismark Palm produces small fragrant flowers. The Bismarck Palm is dioecious, male and female flowers are on different plants. Cream flowers grow in clusters on 3ft long stalks which gets bent downwards by the fruit weight. Beautiful flowers are followed by not-eatable blue fruits. Fruits are oblong and 1/2 – 1 inch in diameter. Growth Rate: Domestic Bismarck Palm can grow up to 30-40ft tall and 20ft wide, but in the wild it can reach 70ft. It is a fast growing palm that can grow from 3ft to 15 ft tall in 5 years. Cold Tolerance: The Bismarck Palm is very cold hardy and can tolerate cold down to 15F when mature enough. Great for zones 8b (15 to 20 F) – 11 (above 40 F). Sunlight: Partial shade to Full sun. Adapts to many kinds of soil and likes full sun. If you don’t have sunny spot, don’t worry it will tolerate some shade. Maintenance: Low. It’s a great tree for gardeners who want low maintenance palm tree. Apply good quality palm fertilizer that has continues release formula twice a year during growing season.